If You Played, You’re Part Of The International Quizzing Rankings! All World Quizzing Championships scores have been added to the International Quizzing Rankings, so all players now have an International Quiz Ranking. Every month, there’s a 100-question international quiz for rankings points called the Hot 100. You can get a group together and join us! Email hot100@quizzing.com for details. 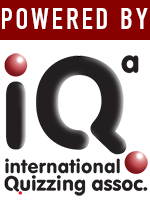 Just head to the Quizzing Store where you will find the WQC questions along with over 150 other sets of questions. Note: Please allow a few moments whilst the calculations update and load for the results to appear. Get into training right now to get your brain geared up for our next event!